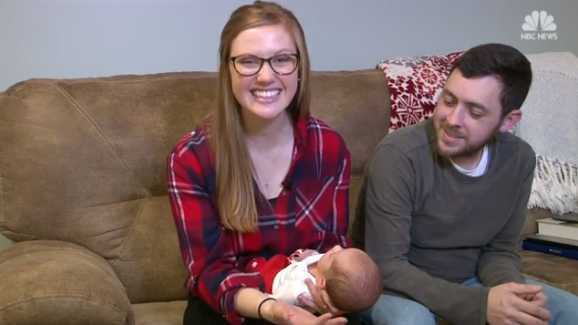 KNOXVILLE, Tenn. — A 26-year-old Tennessee woman has given birth to a baby that had been frozen as an IVF embryo for 24 years. Tina Gibson and her husband Benjamin wanted to have children, but as Benjamin has cystic fibrosis, they knew the chances of conceiving on their own were low. Therefore, they assumed that one day they would adopt. The Gibsons began taking in foster children. However, last year, as they were dropping off their dog at Tina’s father’s house before going on vacation, he advised that he had just learned about embryo adoption via a news feature. Tina told her father that she and her husband were too busy with fostering at the moment and weren’t interested. But, as the couple went on their way to their vacation destination, they couldn’t get the thought out of their minds. Tina began researching the option on her phone, and in the weeks that passed—with much prayer, she felt more comfortable with moving forward. The Gibsons discovered that Tina would indeed be a candidate for implantation, and successfully passed the home study. In March, they were ready to proceed, and began reviewing the profiles of approximately 300 couples whose embryos had been stored from IVF procedures. After learning that their first choice would not be viable, they went with the second. Out of the three embryos from that donor that were transferred into the uterine cavity, one implanted successfully and thrived. However, Tina did not expect the news that the medical director at the faith-based Southeastern Center for Fertility and Reproductive Surgery was about to share: The baby had been frozen since October 14, 1992—24 1/2 years ago at the time of implantation. Tina was 25 at the time, and turned 26 months later. “[I]t is kind of neat that this embryo was conceived just a year or so after the mother was,” Dr. Jeffrey Keenan told NBC News. “If the baby was born when it was supposed to born, we could have been best friends,” Gibson marveled. According to the University of Tennessee Preston Medical Library, the baby also holds the record for the longest preserved embryo to be born. Last month, Tina gave birth to a healthy girl that she and Benjamin named Emma Wren. There are several faith-based agencies that encourage and accommodate snowflake adoptions so that stored embryos will not be destroyed. There are believed to be anywhere from 400,000 to a million embryos in storage in the United States, some of whom will be thawed and allowed to die if not adopted, which is why some pro-lifers oppose IVF due to the destruction of life that often results. Some pro-life Americans have personally adopted embryos in an effort to at least save one child.